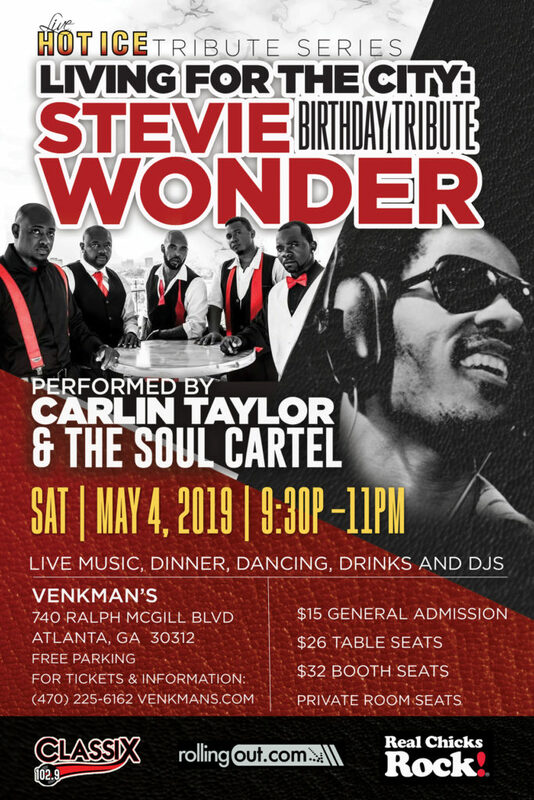 Living for the City: Tribute to Stevie Wonder - Venkman's | 740 Ralph McGill Blvd. Just one week before his actual birthday, Classix 1029 FM, Hot Ice LIVE & Venkman’s present “Living for The City: A Tribute to Stevie Wonder. Come party in honor of The Natural Wonder with Live Music, Dinner, Dancing, Drinks, and DJs. Born in 1950 in Michigan, singer, songwriter, and multi-instrumentalist Stevie Wonder made his recording debut at age 11, becoming a 1960s force to be reckoned with via chart hits like “Fingertips, Pt. 2,” “I Was Made to Love Her” and “My Cherie Amour.” Over the next decade, Wonder would have an array of No. 1 songs on the pop and R&B charts, including “Superstition,” “You Are the Sunshine of My Life,” “Higher Ground,” “Boogie on Reggae Woman,” “Sir Duke” and “I Wish” from the albums Talking Book, Innervisions, Fulfillingness’ First Finale and Songs in the Key of Life. A native of Miami, Carlin Taylor is a consummate entertainer on a mission. His band Soul Cartel performs for enthralled audiences. As a regular performer with Hot Ice LIVE, his in-character performances, vocal range, and dance moves have been showcased across a number of our shows including Marvin Gaye, Rick James, the Ohio Players, Bootsy Collins and more. PLEASE NOTE: If earlier dinner reservations are made, your seats are not guaranteed for the show. For example, you cannot reserve a table at 8:00 pm and keep it for a 10:00 pm show. The only way to guarantee a seat for the show is to purchase table, booth, or banquette tickets.